I very much enjoyed attending Local Gov Camp North West last weekend. Although it was attended by fewer people than other unconferences I’ve been to (due to people crying off for fear the impending snowpocalypse would leave them stranded in northern wastelands; I mean Preston), this meant it was a more intimate event, the smaller groups allowing everyone a chance to speak more. I curated lots of links tweeted during the event, using Pinboard. With some attendees also leaving early as news of snowbound roads and delayed trains filtered through to us, it seemed that we wouldn’t be able to fill the final hour’s worth of breakout sessions. This gave me the chance to propose trying something I’ve wanted to do at a GovCamp since experiencing them at GLAMCamp Amsterdam last December: lightning talks. The three-day GLAMCamp event had one hour of such talks scheduled, but they proved so popular that it was agreed to set aside another two. Anyone who had an idea to pitch, a story to share or a problem they wanted help to solve, could speak for a maximum of five minutes (less if that was all they needed), but unlike most unconference sessions, they could speak to most of the attendees at once. Details of the GLAMsterdam lightning talks were captured on an Etherpad for Saturday and an Etherpad for Sunday, which have links to individual videos of several of the talks. Because the lightning talks were only a few minutes long, there wasn’t really time for people to grow bored if a particular talk wasn’t relevant to them, and they could always check their mail or social media, grab a drink or take a comfort break if they did. I gave a quick, inpromptu talk on my deployment of microformats on Wikipedia. Many people, who wouldn’t have elected to come to a full session on the topic, told me they found it useful. I’m glad to say people at #LocalGovCampNW (as we hash-tagged it) readily accepted my proposal and am grateful for that, and their participation. We restricted the talks to just three minutes (I was ruthless with my stopwatch app), and despite people having had little time to prepare (which I think was a disadvantage), and no use of Powerpoint (unlike at GLAMcamp), we managed to cover several topics in about 20 minutes, ranging from SMS alerts to data visualisation and from promoting an upcoming event, the Eureka Festival of Resources, to my talk on BrewCamp. While some talks were curtailed after the allotted time, conversations could be and were continued afterwards, and online; the interested participants having had the opportunity to identify one another. Daniel Goodwin, Chief Executive of St Albans City & District Council, said they “provided an interesting insight into people’s concerns“. 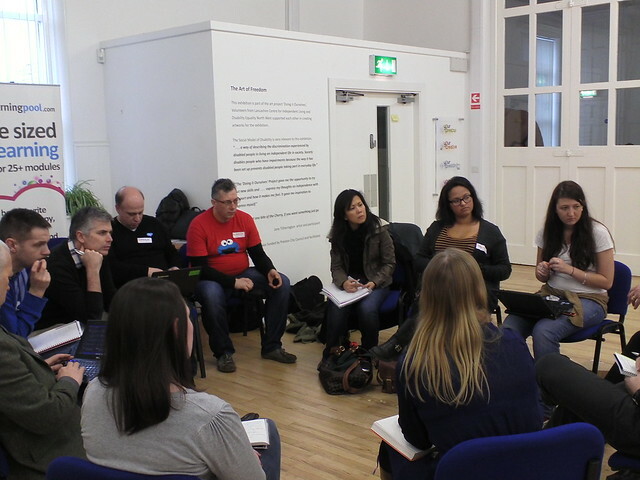 Why not try a session of lightning talks at your next unconference? This entry was posted in hyperlocal, ideas, local government, microformats, Wikipedia and tagged BrewCamp, Celebration20, EurekaFestivalOfResources, GLAMCamp, iGLAMsterdam, JohnPopham, LightningTalk, LightningTalks, LocalGovCampNW, microformats, Preston, wikipedia. Bookmark the permalink. That’s an interesting concept, which also has the advantage of working in one room, i.e. if you don’t have a venue with several rooms for people to disappear into, you can still use this format. I’m organising a PEP-NET event at the moment, and the problem with having a full-blown unconference would have been the space. So maybe we’ll do something like this. With unconferences there’s a risk that sessions are dominated by the most gregarious and outspoken participants. Giving everyone their three minutes talk-time levels the field and gives quieter types the opportunity to speak. The lightning talks were probably my favourite* part of the day – thanks very much for suggesting them. I’d like to see them incorporated in to every event.